PRODUCT DESCRIPTION: Total Kill herbicide. It can be used to kill just about any type of weed. Very similar to Roundup. It leaves no residual so turf or other areas where it's applied can grow grass or other plants within a short period of time following treatments. WHERE TO USE IT: Parking lots, driveways, along fence rows, pine isles, mulch islands and just about anywhere you want to knock out persistent weed growth. 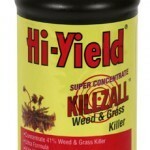 Remember, Killzall is a total vegetation kill so be careful of over spray and drift.